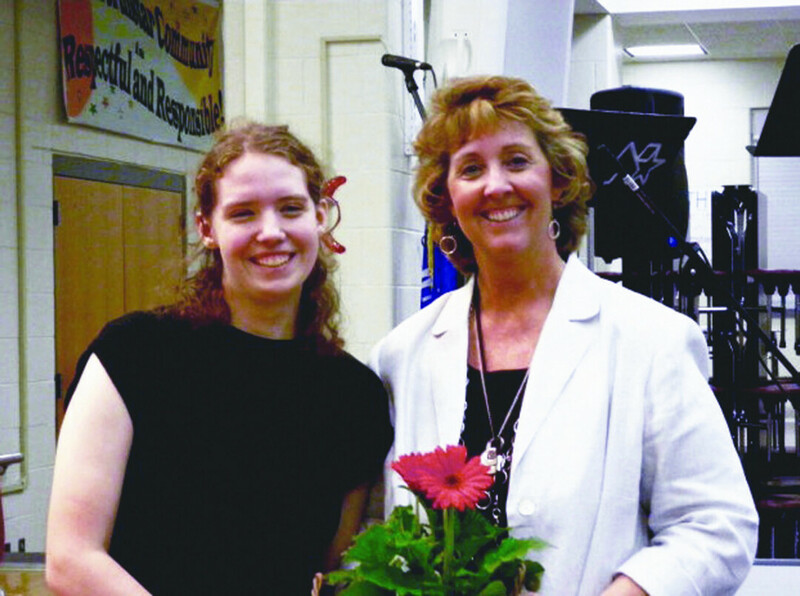 Retiring Northstar Middle School band director Laurie Francis (right) and former student Kim Osberg. Francis commissioned Osberg to compose music for the director’s final concert, capping off her 21-year career. The Northstar Middle School band is busy tuning instruments, memorizing sheet music, and practicing parts for their Annual Spring Concert. While the eighth graders are no strangers to the stage, this concert is special because it marks the retirement of their long-time band director, Laurie Francis. Francis has been teaching at Northstar for the past 21 years, and for her final concert, she commissioned one of her former students – up-and-coming composer Kim Osberg – to write an original piece for the band. “I thought it would be neat to do something I had never done before and commission a work to be created just for us,” Francis said. The piece Osberg wrote is cleverly entitled “Band Together” because the structure of the music follows the journey that bands take together. Just over five minutes long, the piece incorporates the sound of air, blowing, fingers moving on keys, followed by chaos and confusion, then playfulness, joy, fear, and sadness as their time together ends. “Her piece uses great words throughout it to help my band students relate to what happens in their journey through band or maybe even life,” Francis said. The students have been rigorously working on “Band Together” since January, and while the piece has come together seamlessly, it has not been without its challenges. The piece requires that the students learn a different type of music notation known as “aleatory,” where the conductor cues in sections, rather than conducts beats. This means that the students must learn to listen and respond to each other without the help of a conductor. Kim visited Northstar for a week to explain and teach the piece to the students.